Carpet Cleaning in Redmond happens every day why not choose a company that you can be sure will do the best job that can be done on that Carpet. We stand behind everything we do if your not happy for any reason we will come back! Your satisfaction is very important to us. Our products are all safe for you your family and pets. We use top of the line truck mounted steam cleaning machines. 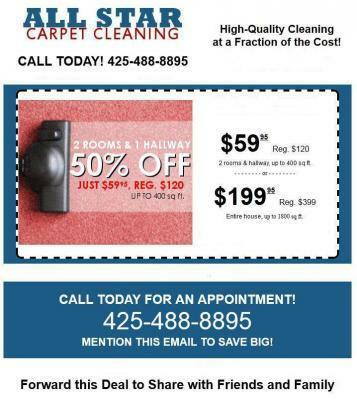 We have power scrubbers for carpet that has not been cleaned in a long time so we can get that heavy soiled if needed. All Star Carpet Cleaning also cleans upholstery and area rugs so give us a call or leave your info and we will get back to you. Look forward to hearing from you have a good day.